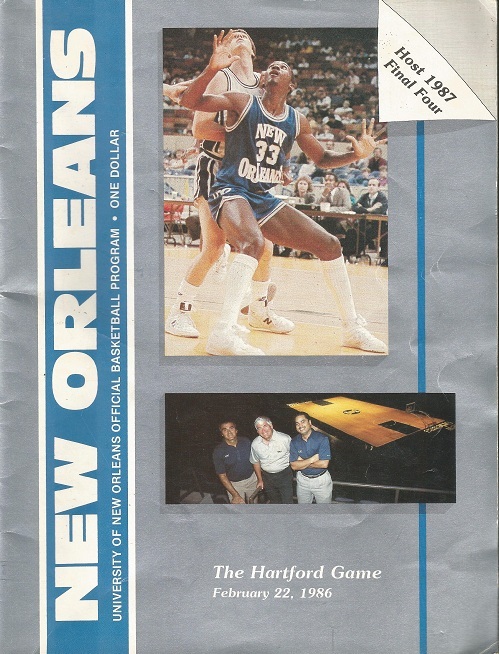 During UNO's previous foray into independence, it played a late February 1986 showdown at Lakefront Arena against... the Hartford Hawks. * UNO defeated Hartford 55-44 before 3,572 fans at Lakefront Arena. It was UNO's homecoming game. * The win improved UNO's record to 16-8, but it was the final victory of the 1985-86 season for the Privateers. They lost their final four games of the year to play their way out of postseason, although Coach Benny Dees did receive a postseason invite in the mail -- mistakenly. It was intended for the University of Nebraska-Omaha. * That is Sam Jones on the cover, against an undetermined opponent. Educated guess? Notre Dame. * Also pictured is the 1985-86 coaching staff. From left to right, assistant Art Tolis, Dees, and assistant Kirk Saulny. * This was Hartford's second year in Division I. They've still never appeared in the NCAA Tournament. * To date, this is the only time UNO and Hartford have met in basketball.